Recently, I’ve been wanting to change my makeup and skin care routine. I was using Mica Beauty mineral makeup and it was awesome for a long while but after having Khloe, my skin changed. I’ve also noticed that I started getting fine lines on my face which I am NOT happy about AT ALL! I don’t have forehead wrinkles, thank God but I did want to get a more mature skin care routine to be proactive about aging. I recently watched a YouTuber named Angie who has a channel called Hot and Flashy. Although her channel is for 50 and older, I found her reviews of product to be beneficial, honest and well put together. She went over her skin care routine and why she likes the products and I wrote them down and looked them up online. All the reviews were good. So, I gathered my $7 is coupons I collected and headed to Walmart. CeraVe products were my mission. 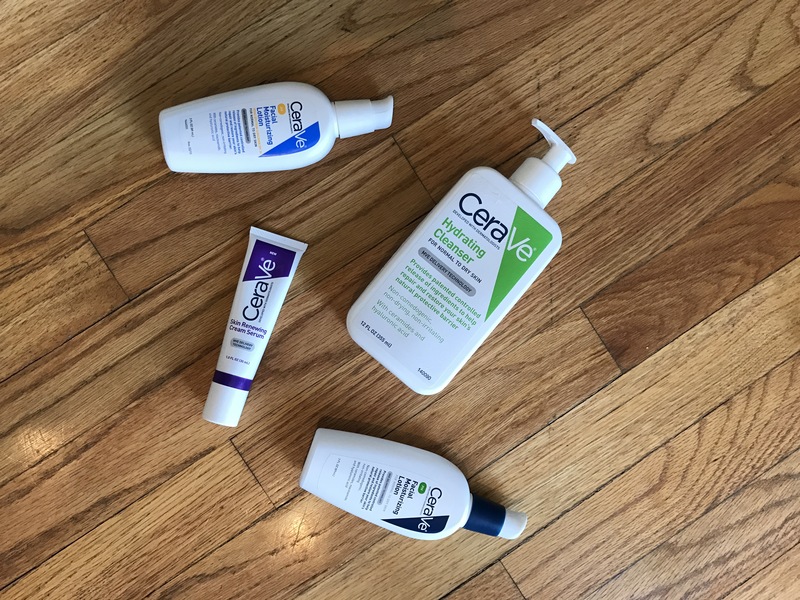 I saw a dermatologist a long time ago and CeraVe was a product she had recommended then so I wasn’t too shocked that this is where I ended up again. I wash my face at night with CeraVe Hydrating Cleanser for normal to oily skin. It’s super gentle and has hyaluronic acid in it which is what I was hoping for anyway. After my nightly wash I apply Skin renewing cream serum and PM moisturizing lotion. I was surprised to wake up to a super soft face that felt moisturized STILL. I do not wash my face in the morning but I do rinse it with water and pat dry then I apply the AM moisturizing lotion which contains SPF 30. My pervious moisturizer only had 15, so this is awesome considering we are outdoors a lot and I do tend to get freckles on my face, which I HATE. 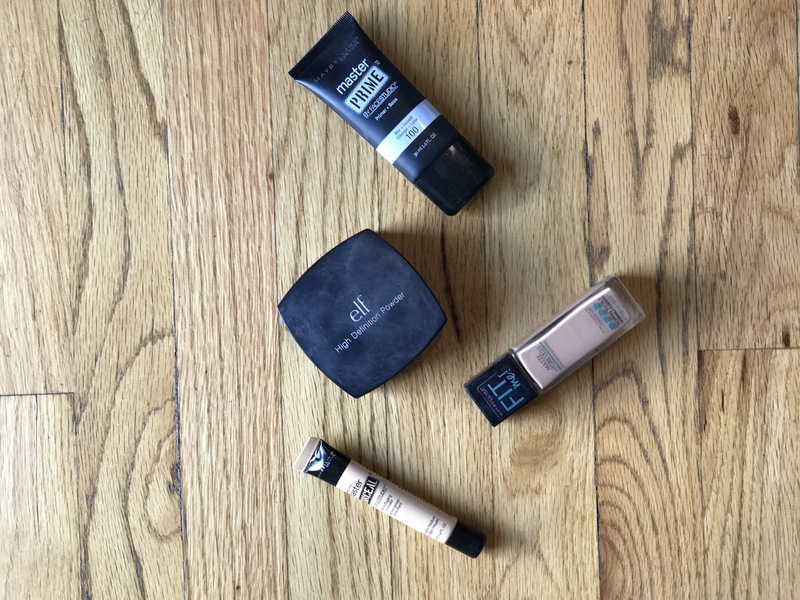 I have used these products for a little over a week and I have had no reaction to any of it. It’s all super gentle and dermatologist recommended. I tend to get hormonal acne which I take evening primrose oil for every day. Not only does it help with acne, it also helps balance hormones and I can tell when I forget to take it. I get a bit crazy and emotional. It’s insane. I buy that on Amazon. I do not wear makeup every day but if I leave the house I have been doing my quick 10 min face which includes foundation, a little contour, blush and mascara. Again, I watched one of Angie’s reviews and she recommended several Maybelline products to try. I went ahead and read several other reviews and decided to make my purchases. I used Amazon for most of these and Walmart (I don’t like Walmart but it’s close to my house and it’s cheaper). I’ve always been a high end makeup girl but right now I cannot afford the higher end stuff and honestly the drug store makeup has come a LONG way since I last tried it. 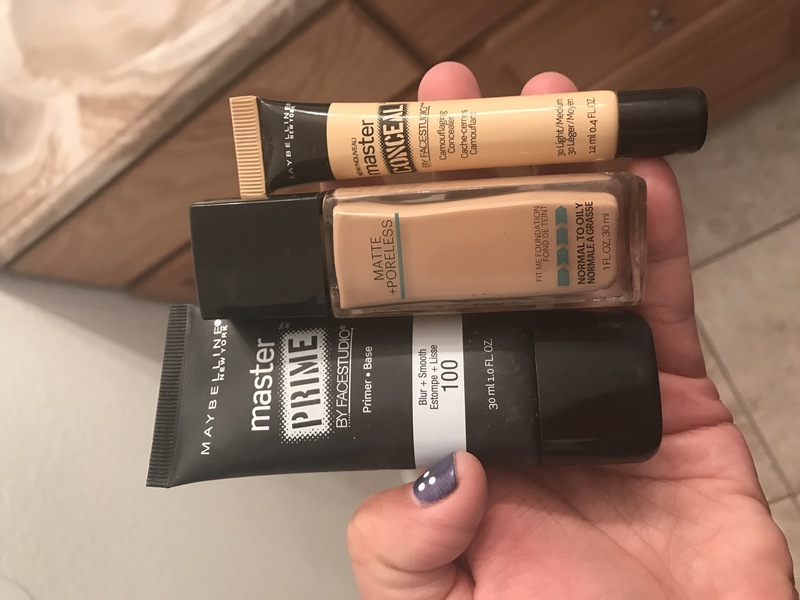 For my makeup primer I used Maybelline Prime Master Blur + Smooth. When I used this with my other makeup I didn’t like it. However, using it with the Maybelline Fit Me Matte and Poreless foundation, it works wonderfully. The two were made for each other. For my concealer, I used Maybelline’s Master Conceal in light/medium. I use this under my eyes and some contour. In my opinion this is a medium coverage concealer. I would give it a 7 out of 10 only because I prefer a heavier coverage concealer for my hyperpigmentation and acne scars. For my foundation, I used the Maybelline Fit Me Matte + Poreless in true beige 222. This was almost a perfect match for my skin tone. I would say it is also a medium coverage foundation. To determine my color match I went on the Maybelline website and took their little quiz to determine what color was best for me and sure enough, it was right. I would highly suggest doing that before heading to the store. The last thing I apply to my face is the e.l.f high definition powder. I’ve had this in my makeup box for a while because I didn’t really know how to use it. Well, this helps set your makeup on your face and kind of gives your skin a smoother appearance. I apply an extra dusting to my under eye area to set that concealer. I also like the e.l.f contour pallet (not pictured). I’ve been using it for a long time and it’s a go to every time I put on my makeup. Guys, don’t turn your nose up at e.l.f makeup. It’s super affordable but their products are pretty decent; especially if you’re on a super tight budget. Their primers and eyebrow kit are also a staple in my makeup box. Edited to add: I worked out in my makeup last night to test how it held up under pressure and I have to say it did really well. 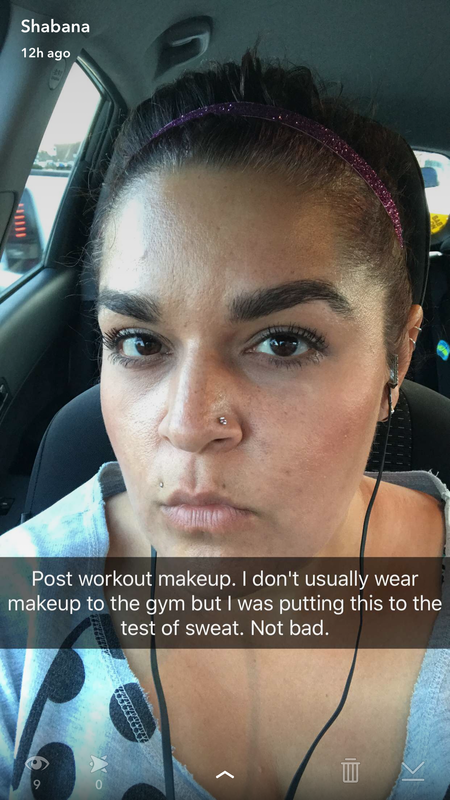 I will note that I usually do NOT workout in makeup but I really wanted you all to see the results. Here is a picture I took with SnapChat! This is after a full day of wear, a workout and 12,000 steps! So, I say it did real well! I like the makeup choices. I haven’t changed mine in forever!